We start all of our poultry out in brooders. Heat and shelter while they have down covering their little bodies. As they mature and grow, feathers grow in, usually starting with wing feathers first. Their legs and feet grow longer and stronger. And once they are fully feathered, the heat is removed, and after that they move to the field pens. There are roosts in the field pens higher than their heads, so they can easily walk around, and still have a spot to jump up to at night. When little they still have roosting instincts. But can't jump very high. 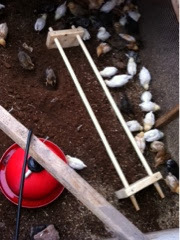 In their brooder are exercise bars. Little roosts for their little selves to practice and get used to gripping. These little laying hens will start producing next spring, by early April. The first few eggs will be tiny ones. By the time farmers markets start in May they will be making good sized eggs in good quantities.